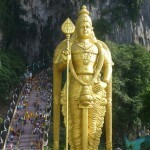 Early start today with catching up with the KL Couchsurfing group to head out to The Batu Caves for Thaipusam celebrations. 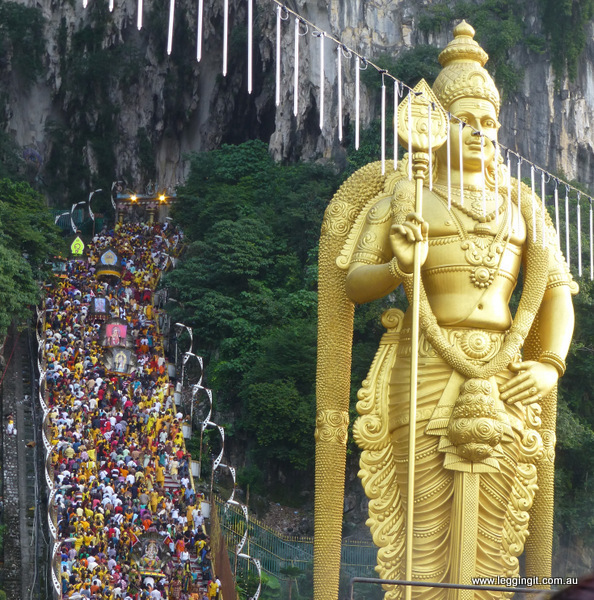 The train out to Batu Caves was pretty crowded but at 2Ringgit you cant complain. 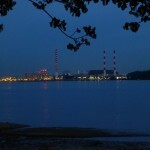 Michele met a nice English lady named Brenda (hello if you’re reading) who is in KL while her husband is working here. 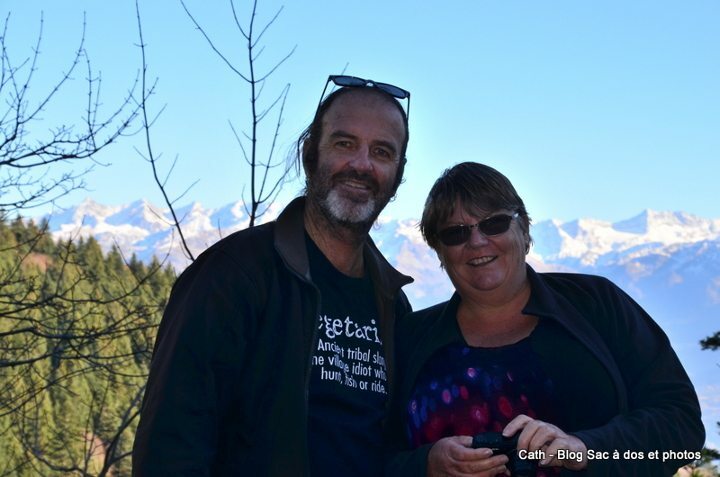 They had a lovely chat while getting on the train about travelling, our trip and Michele discussed the pros of Couchsurfing so she is going to encourage her children to get involved. 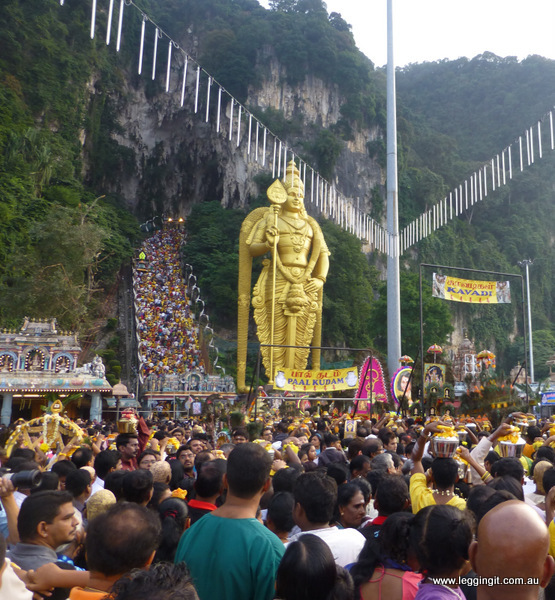 Batu Caves was mega crowded and the music was really loud with Hindi music blasting from speakers above the crowds. 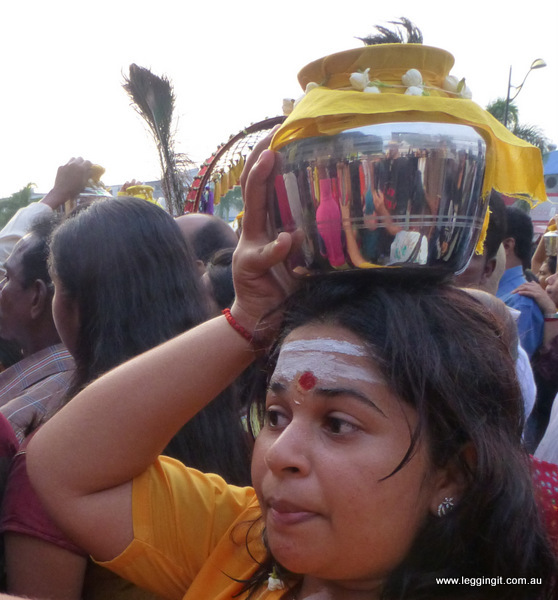 The whole area had transformed from two days ago and now there were Marques everywhere filled with stalls selling all sorts of Indian sweets, food, clothes, pots, flashing idols, furniture and day to day necessities of Indian life. The whole place was alive with colour, people and lots of noise. 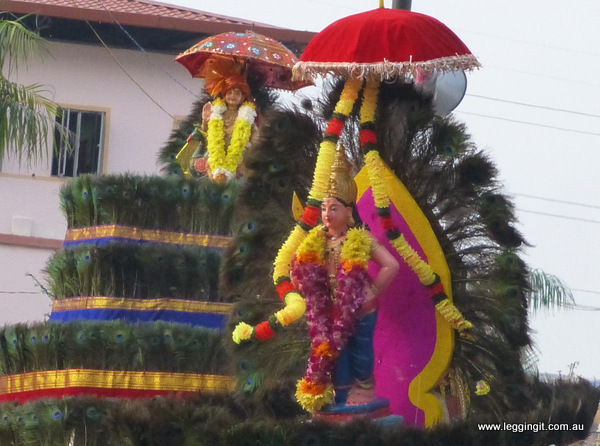 As we got closer to the main procession the crowd became thicker and thicker with hundreds of people jostling for the best vantage spots to get the perfect camera shot or join the parade. The procession leading to the gates at the bottom of the steps to the cave was almost stationary and every now and then the pilgrims would shuffle a few inches forward. 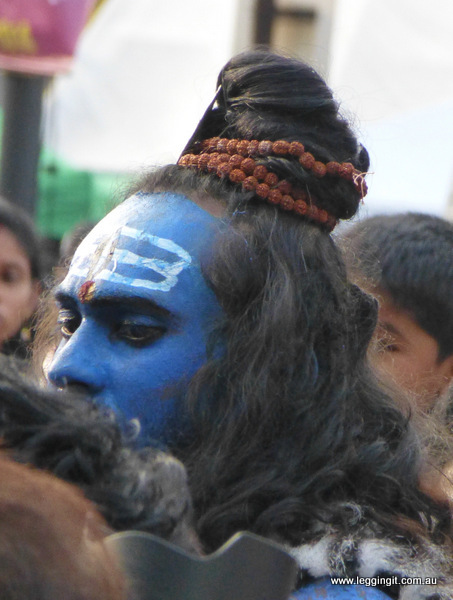 There were so many people slowly making their way towards the cave some carrying small Paal Kudams, some with freshly shaved heads covered in grated orange peel, women with jugs of milk on their heads and people with large stainless steel pins through their, cheeks, foreheads, and tongues. 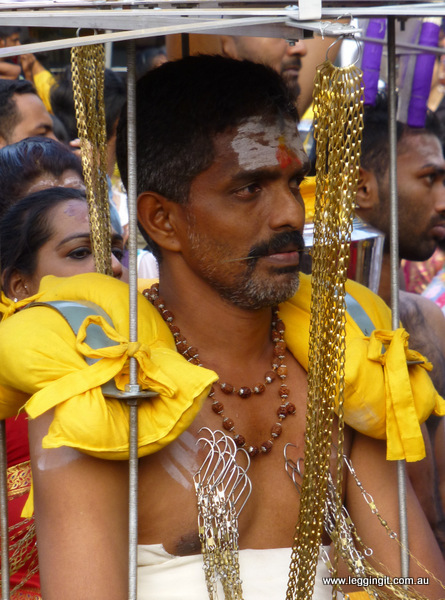 The strangest sight, however, was the pilgrims carrying huge Kavadi, with chains and ropes leading to hooks through their skin. 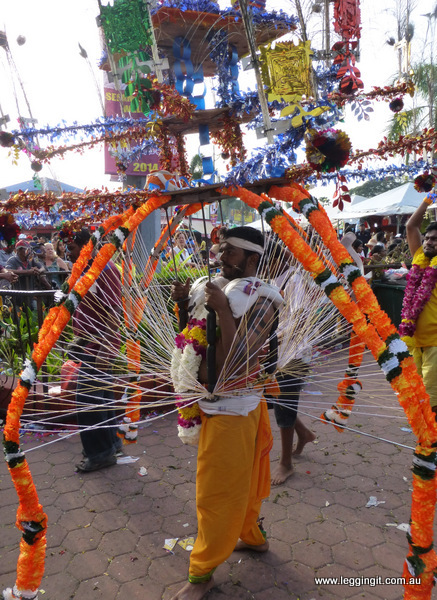 There were local Indian musicians who’d play and the Kavadi carriers would dance and the huge Kavadi would shake and almost tip over. 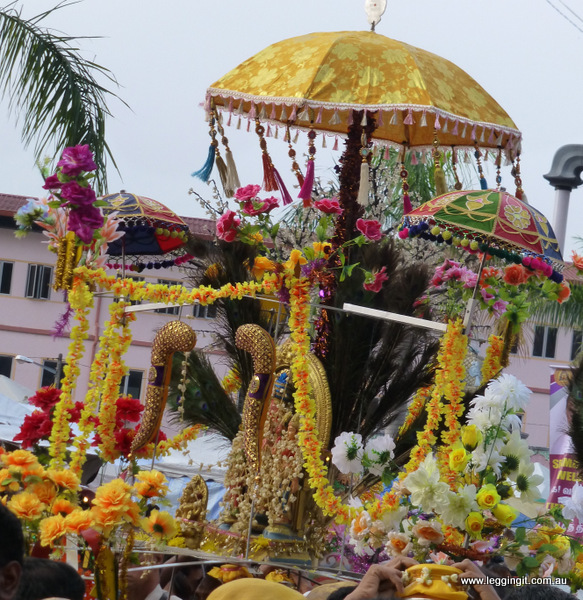 There were also large Kavadi chariots which were pushed through the crowds. 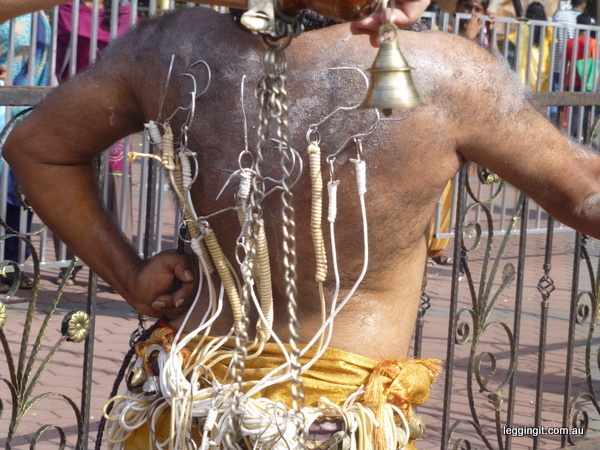 The largest had a man covered in hooks and was in a trance behaving like a monkey very strange to see. With all this audiovisual overload we decided on a break at the Indian cafe we’d had breakfast at a few days ago. The place was pretty crowded but we found a table with some nice Indian families. The sign said pay before self-service but I paid for 2 Roti Canai and 2 Teh Tarik (only 6 Ringgit, not bad for festival prices) and they delivered it to our table. We ventured back out into the crowd and tried to cross over the procession but were swept away in the torrent like crowd so had to go with it and wait until we got out the gates and tried another way. 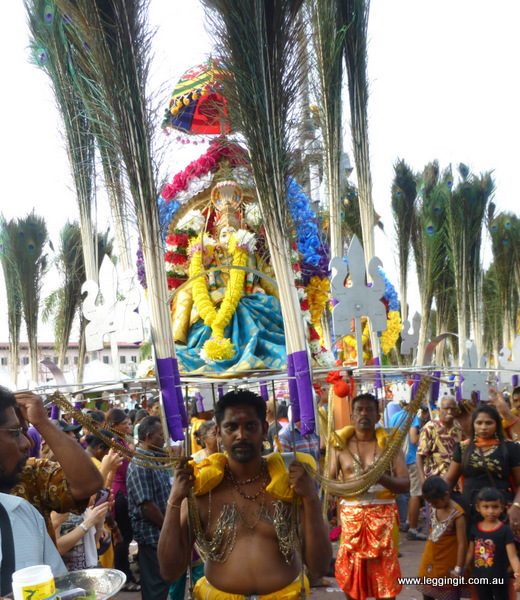 We did a lap of the stalls and made our way across closer to the steps leading to the cave between the Kavadi carriers and into the other marque area. We had a bit of a browse and decided to head back to the quietness of the city lol. A nice Indian lady got up and gave Michele her seat (dunno if its the grey hair or she could see Michele was spent) her son got up a few stops later (with his mothers prompting)and gave me his seat and I was honoured by the gesture. Across from us, a family slept on each other’s shoulders oblivious to the world and obviously, the festival was too much for them. 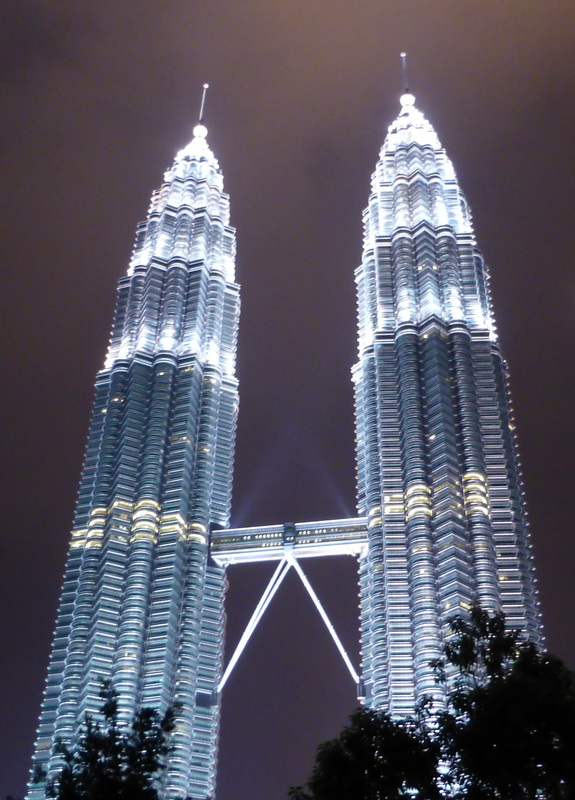 After an afternoon siesta, we headed out to KLCC Station for a walk around the park around Suria shopping centre and sat around drinking expensive coffee waiting for the sound light and water show at 730. 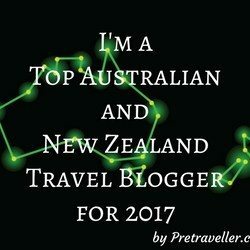 We had a meal of Penang Laksa, and Penang Char Kway Teow which was delicious and made us keen for our visit to Penang next week. 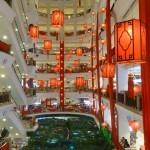 The light, sound and water show was in the shopping centre forecourt. 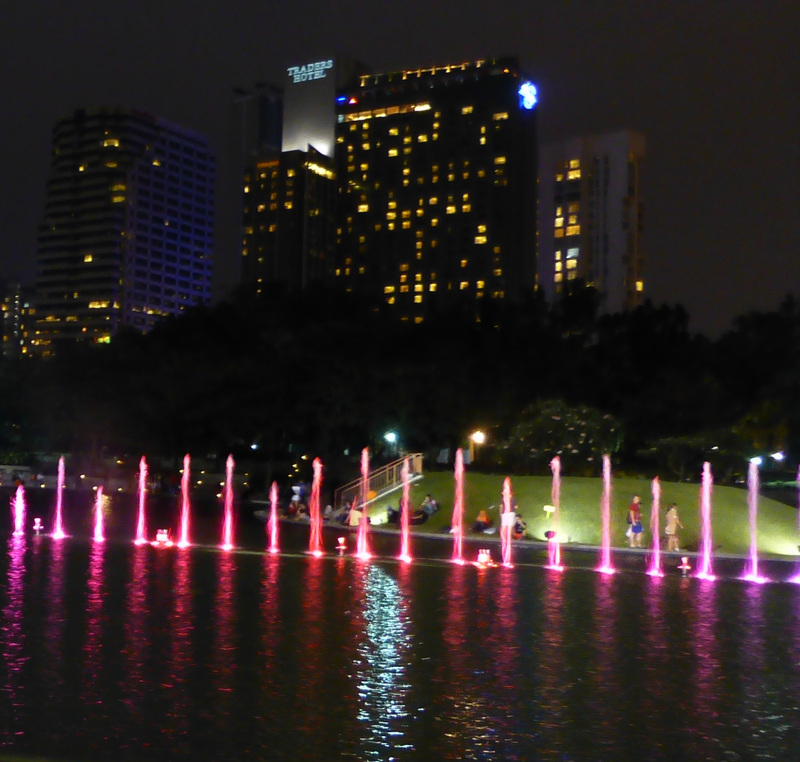 The fountain heads lit up all sorts of colours and put on a really spectacular show with the beautiful backdrop of the Petronas Towers all lit up shining like crystal in the background. After the show we caught the LRT home so we could get an early night as tomorrow is Nik’s daughter’s wedding day so we must be well rested. 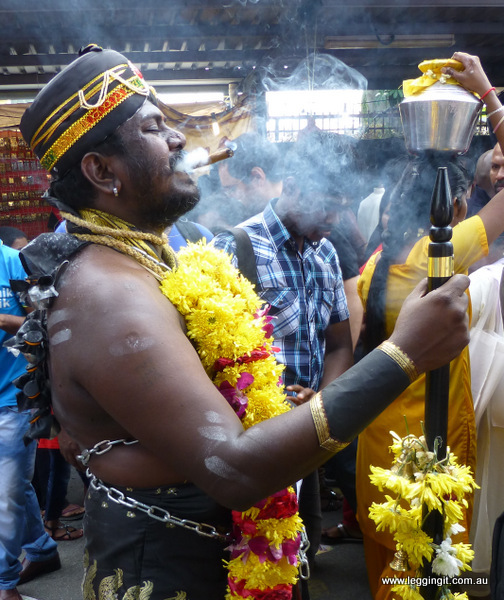 One thing I must say about Thaipusam today Indians sure know how to put on a celebration.